In a large bowl, toss sweet potatoes and poblano peppers in oil and cumin. Spread vegetables on a large sheet pan and roast in preheated oven sweet potatoes and peppers are soft and tender, about 45 minutes. Remove vegetables from oven and cool. In a large bowl, toss roasted pepper and sweet potato mixture with black beans. Roll about ½ cup of the mixture into each soft tortilla shell and place, seam-side down, in a 9-by-13-inch baking dish. 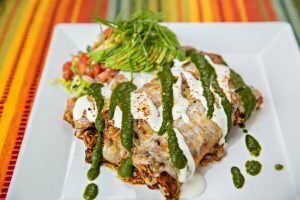 Top enchiladas with ancho sauce. 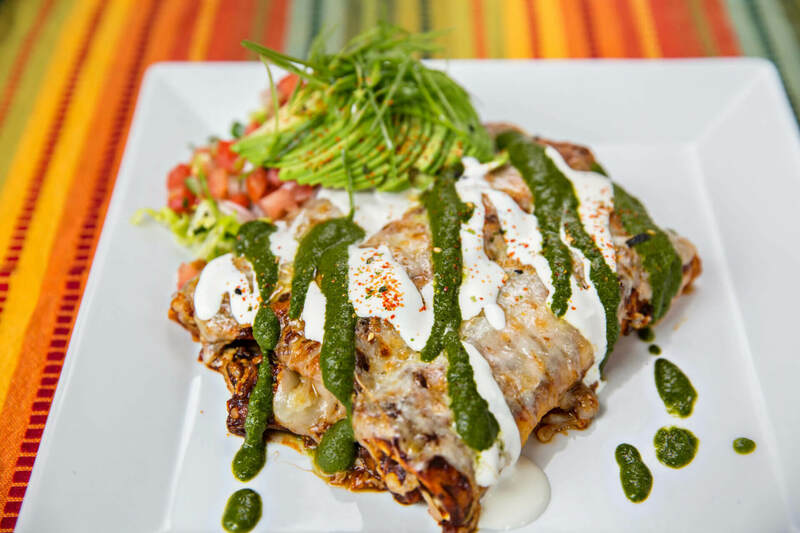 Sprinkle cheese over enchiladas and bake, uncovered, in a 350-degree oven for 45 minutes to 1 hour, until cheese is melted and contents are bubbling. Top with chimichurri sauce and fresh cilantro. Pulse all ingredients in a food processor until desired texture is achieved. At Chupacabra, we like it smooth.